Jeb Bush on path to citizenship: Flip-flopping while book promoting. Jeb Bush is telling you that the long lag times involved in traditional book publishing don’t comport all that well with a politician’s imperative to flip-flop. Former Florida Gov. 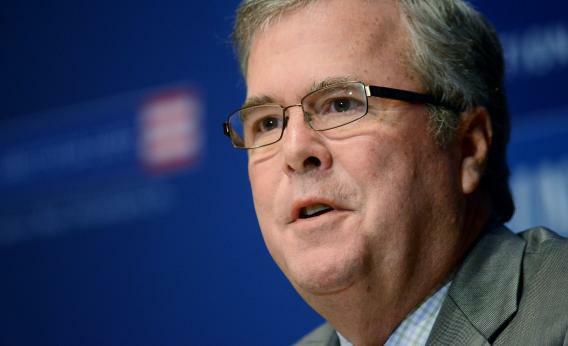 Jeb Bush made waves yesterday when text from his new book Immigration Wars came out. Bush, like his brother, is closely affiliated with the pro-immigration wing of the GOP so the book’s statement that under his plan “those who violated the laws can remain but cannot obtain the cherished fruits of citizenship” was big news. Basically what Bush is telling you is that the long lag times involved in traditional book publishing don’t comport all that well with a politician’s imperative to flip-flop. Back in 2007 or 2008, many conservatives opposed the idea of a path to citizenship, but there was a large faction of the GOP—led by then-President George W. Bush and likely presidential contender John McCain—that supported such a path. Then came the election of Barack Obama, and the path to citizenship went the way of Romneycare or cap and trade. Bush worked on the book during that period. But Mitt Romney’s electoral defeat seems to have re-energized the pro-immigration wing of the party which is trying to sell other factions on the idea that concessions on the immigration front will let Republicans avoid concessions on other party areas. As my colleague Dave Weigel says, one moral of the story here is that in the future savvy politicians will stick to quick-and-dirty ebooks that make it easier to tailor your message to the times.